If you’ve ever woken up with severe pain in the base of your big toe, instep, or ankle, you may have had a bout of gout. In foot as well as hand and wrist areas, gout is unpleasant but can be short-lived if treated correctly. Gout in foot? This illustration pinpoints the symptoms you may be feeling. What is gout? It’s an inflammatory arthritis–some call it “gouty arthritis”—caused by the formation of needle-like uric acid crystals in the joint. Hyperuricemia (high blood urate levels) leads to crystal formation and severe episodes of acute pain, stiffness, tenderness, warmth, redness, and swelling, often striking along the base of the big toe. In its chronic form, gout can cause irreversible damage to the joints, tendons, and other soft tissue. 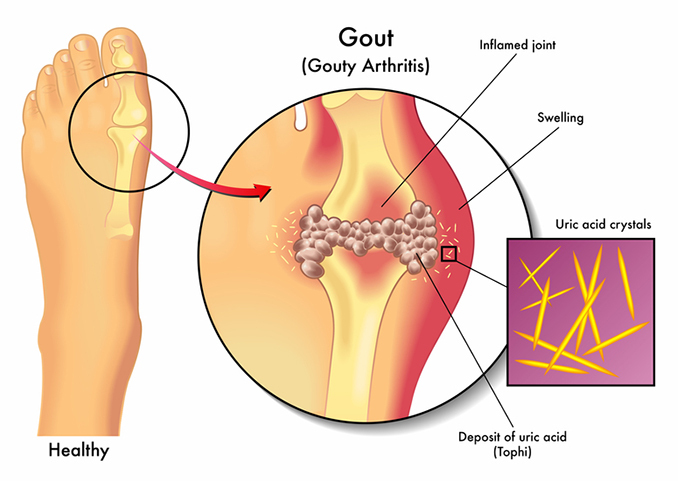 Gout is primarily a metabolic disorder in which uric acid (also known as urate) accumulates in blood (hyperuricemia) and tissues. When tissue levels reach saturation, needle-like crystals form, causing inflammation. This occurs most commonly in the cooler joints, notably the metatarsophalangeal joint of the big toe. Many people with hyperuricemia never develop gout, but those with the highest levels are most likely to suffer episodes. Hyperuricemia may also lead to kidney stones. In about 90 percent of hyperuricaemia cases, there is impaired renal excretion; in about 10 percent, there is a problem with overproduction. Urate overproduction can be linked to lifestyle factors and certain diseases such as bone marrow cancers, psoriasis, and hemolytic anemia. Lifestyle factors include being overweight and ingesting excess amount of fructose or alcohol. Renal impairment has multiple causes, including gene mutations, hypertension, diuretic drugs, lead exposure, and cyclosporine immunosuppressive therapy. Gender and age. Men are twice as likely to develop gout as women. In men, the risk rises with age. Gout is uncommon in younger women but the incidence increases dramatically after menopause, due to falling estrogen. Western diet. There is solid evidence from the Health Professional Follow-up Study (HPFS) of a link between gout and purine-rich foods. See gout diet. Medications. Diuretics, antihypertensives, niacin, aspirin, chemotherapy and immunosuppressive drugs increase the risk of gout. Other conditions. Certain conditions carry an increased risk of gout including: Recent joint injury or surgery, cardiovascular disease, chronic pulmonary disease, anemia, psoriasis, renal disease, blood cancers, and metabolic syndrome. It may present with excruciatingly painful swelling of joints; in the big toe, it is known as Podagra. The joint may be stiff and appear red or purple, very swollen, and tender to even light touch. Other gout sites include the instep, wrist, ankle, fingers, and knee. Skin may peel and itch as healing begins. An attack often begins at night; the acute phase lasts up to 12 hours. If untreated, the inflammation may last up to two weeks. In 10 percent of people, acute episodes present in more than one joint. Kidney stones precede the onset of gout in 14 percent of patients. Chronic gout may develop, and it may affect more than one joint, mimicking rheumatoid arthritis. Tophi are soft tissue swellings caused by urate buildup in chronic gout. They may be found in the ear, fingers, toes, kneecap, and elbow. Some people have a single attack of gout, others are affected intermittently, often when they have overindulged or experienced dehydration. It’s rare for complications of gout to develop, but they do happen and can include severe degenerative arthritis, secondary infections, kidney stones and kidney damage, nerve or spinal cord impingement, and joint fractures. Joint aspiration. Fluid is withdrawn from the joint and inspected for crystals and bacteria. Blood tests. White blood cell count, ESR (erythrocyte sedimentation rate), triglycerides, and kidney function (urea and creatinine) may be elevated. X-ray. An x-ray of the affected joint is likely to appear normal during an initial acute episode, but in chronic gout, bone erosion and overhanging edges may be seen. Your doctor will determine the treatment for gout that you require, perhaps using the American College of Rheumatology (ACR) 2012 guidelines. In an acute attack, a combination of NSAIDs (nonsteroidal anti-inflammatory drugs), corticosteroids, and colchicine may be needed. Steroids can be given orally or injected into the muscle or joint. Rest, elevation, ice packs, and increasing water intake may also help alleviate symptoms. Colchicine is a drug that decreases swelling and reduces the buildup of uric acid crystals. Side effects are common and include nausea, vomiting, and diarrhea. It may be used in the acute phase and to prevent further flare-ups. Urate-lowering-treatment (ULT) is usually commenced following an attack. These drugs may be considered if colchicine is not effective, if multiple joints are involved, or if there is a history of kidney stones. These include allopurinol (Aloprim), febuxostat (Uloric), and probenecid (Benemid). The following dietary changes may reduce the risk of recurrent attacks of gout. Processed foods, particularly those containing high fructose corn syrup like sodas and cookies. Fresh vegetables, salads, and fruits (excluding those on the “Restrict” list above). acute pain, after menopause, alcohol, anemia, anti inflammatory, anti inflammatory drugs, arthritis, bacteria, beer, blood cancers, bone, bone marrow, cancers, cardiovascular, cardiovascular disease, cauliflower, chemotherapy, chronic gout, chronic pulmonary disease, coffee, corn, corn syrup, corticosteroids, degenerative arthritis, dehydration, diarrhea, diet, diuretic, erythrocyte sedimentation rate, estrogen, exercise, food, gout, gout diagnosis, gout diet, gout flare, gout foods, gout in foot, gouty arthritis, health, healthy diet, healthy weight, high fructose corn syrup, hydration, hypertension, inflammation, inflammatory arthritis, kidney function, kidney stones, metabolic syndrome, muscle, niacin, nsaids, pain, processed foods, psoriasis, pulmonary disease, purine, purine rich foods, rheumatoid, rheumatoid arthritis, rheumatology, side effects, signs of gout, signs of gout in foot, skin, spinach, supplement, treatment for gout, Triglycerides, uric acid, uric acid crystals, vegetables, vitamin, vitamin c, vomiting and diarrhea, western diet, what is gout. For being updated in 2017, this article is severely out of date. Multiple studies and related articles, including those published under the UHN Daily banner, have shown that neither spinach, cauliflower, mushrooms, and asparagus nor legumes contribute to gout flares even though they are high in purines. Thank you for your comment, Alice. The article has been updated to omit these vegetables from the “avoid” list. I was diagnosed of RA in 2009. I was put on Naprosyn and after some time i didn’t feel any different, so i started on a Natural Rheumatoid Arthritis Formula treatment protocol from RICH HERBS FOUNDATION (ww w. richherbsfoundation. c om), the treatment made a great difference for me, it effectively treated my Rheumatoid Arthritis and symptoms. The swellings, stiffness, fatigue and joint/muscle/body pains has subsided, I feel better overall than i have felt in years. I see no mention of alpha-blockers. I was put on alfuzosin for urinary issues and had one of the worst gout flares ever. Read on a prostrate cancer forum about the problem and stopped the alpha-blocker. Flare went away.